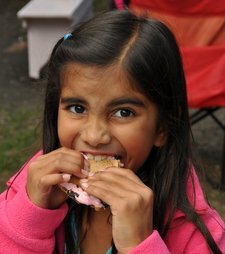 Camp S’more -The Food including THE S’MORE BUFFET! I’ve been saving the best till last, today I’m sharing the food! 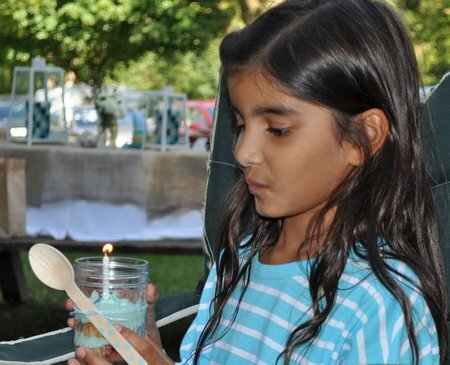 The idea for a camping themed birthday party came from my daughter wanting a campfire to roast hotdogs and marshmallows, so that’s what we did. 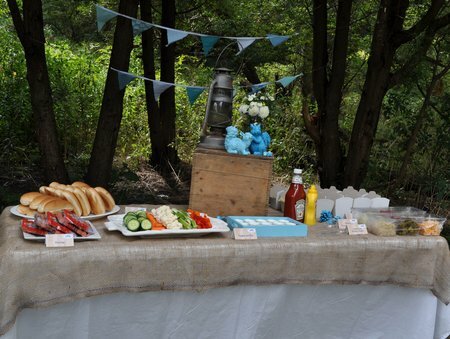 I set up a little buffet for the hotdogs, I love how the centre piece turned out. See all the details of the decor here. The hotdog buffet included the dogs, and buns and some great toppings. 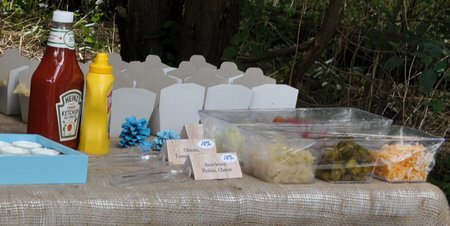 Most of the kids just went for ketchup, but for the rest of us there were some delicious options like fresh chopped tomatoes from my mom’s garden, relish, sauerkraut, pickles, onions and cheese. 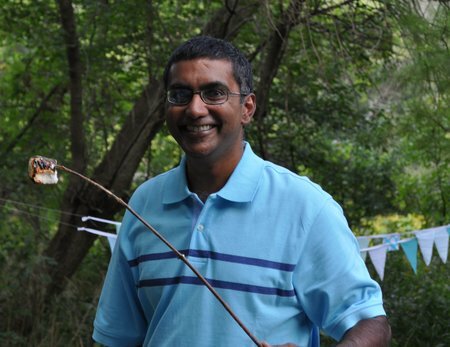 I love a good hotdog, and nothing beats one roasted over a campfire. 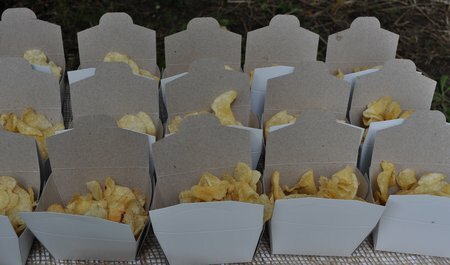 I picked up these cute little take-out french fry boxes and served kettle roasted potato chips in them. The individual servings made it really easy for everyone. Before the party, I made custom roasting sticks for everyone -which turned out to be one of my favourite little details. 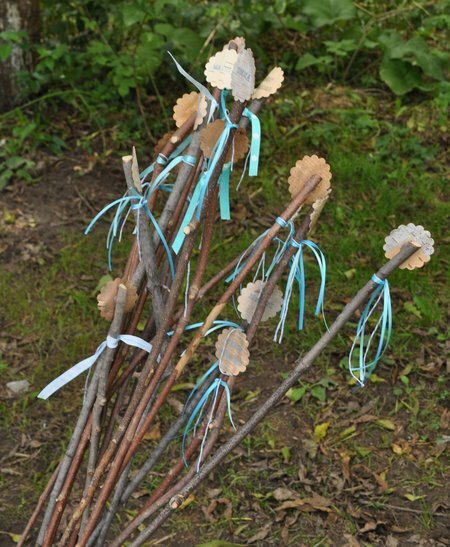 On a trip to the woods I collected some birch bark from the ground and used it to create labels on the sticks. 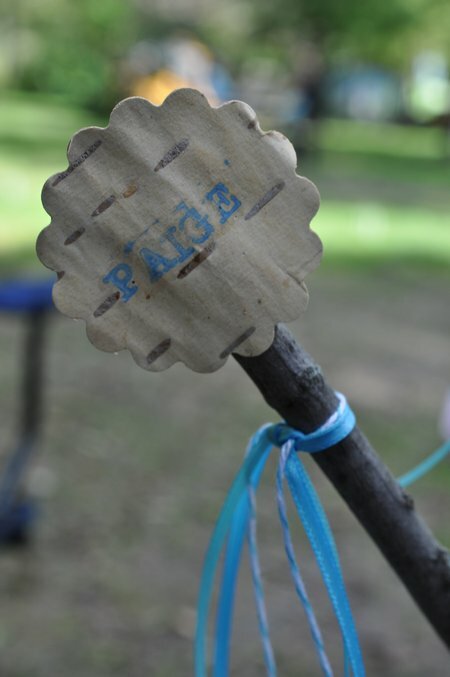 I cut the birch bark with a paper punch -which worked really well. 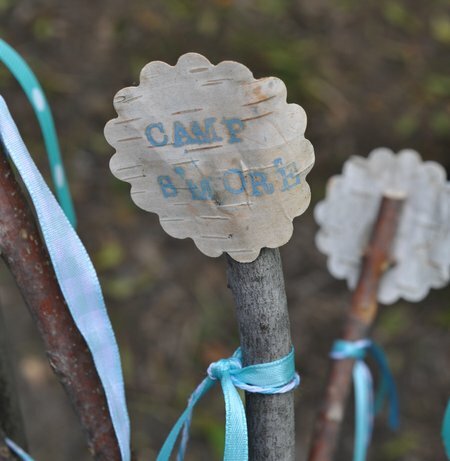 Then I stamped on the kid’s name, or Camp S’more, and finished it with some aqua ribbon to tie them into our theme colour. It worked out really well, everyone had their own stick and they were super cute. 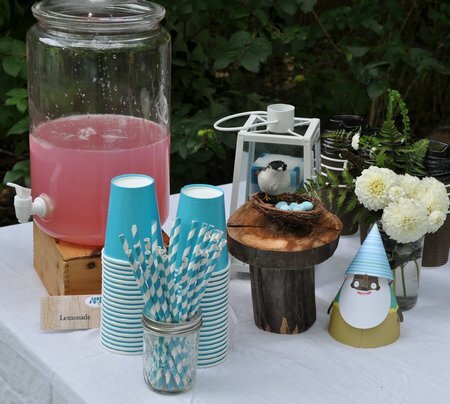 We also had a drink table at the party. We offered spring water and pink lemonade. Since the weather was a little cooler, and fall like, we also had hot chocolate. We made it at home and brought it in some assorted thermos. This worked out really well, since guest could help themselves and it stayed nice and hot. For the hot chocolate we also had some mini-marshmallows, some store bought and some of the home made ones, and whipped cream! 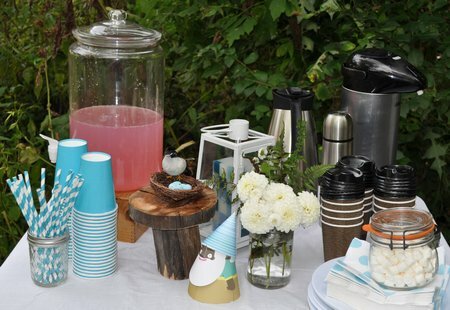 I also really loved the cardboard cups, which came with lids -I found them at A Buck or Two. For dessert we enjoyed the much anticipated S’more Buffet! I made three kinds of cookies to start with. 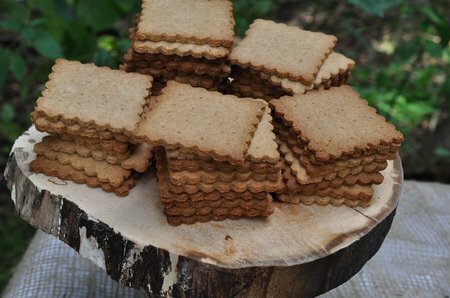 First was the home made graham crackers -read all about them here, -they really are so much better than store bought! I also made chocolate chip cookies, and peanut butter cookies. They were all really good. 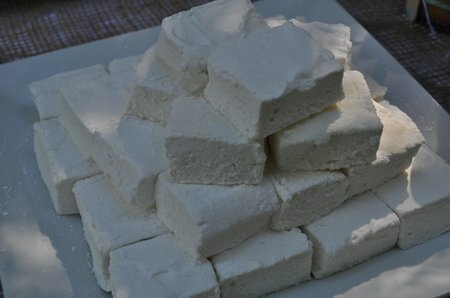 We had six kinds of marshmallows! Most of them I found on a cross-boarder shopping trip at Target -can’t wait for Target to come to Canada! There we got the chocolate, chocolate mint, and cinnamon bun. At home I found coconut, and gigantic strawberry. I made the home made vanilla -my far the best in my humble opinion. Admittedly I went a little over board and there were tons left over, but I have to say for the impact it had, and the kids sense that they’d died and gone to heaven it was definitely worth it! And let’s face, over-board is the way we roll around here! 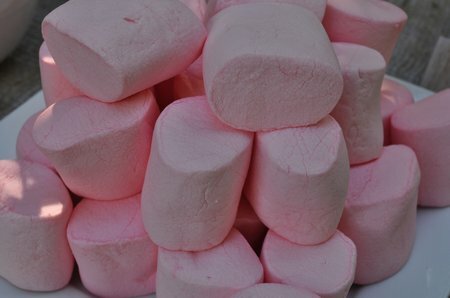 Of course our s’mores also required chocolate. Why have just plain chocolate when you could have a whole bunch of kinds? So we had milk chocolate, dark chocolate, chocolate with almonds, mint chocolate, caramel chocolate, and cookies and cream chocolate. 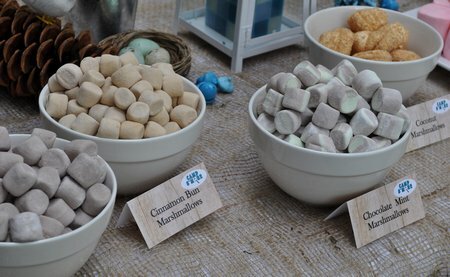 The guests all had a great time, mixing and matching different cookies, marshmallows and chocolate to come up with their own original s’more creations. They ate so many s’mores that they didn’t have room for cupcakes! I made cupcakes in a jar, since they’re perfect for camping. 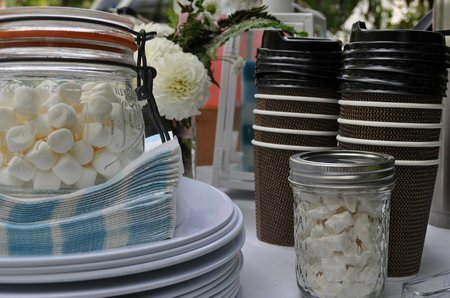 I used small mason jars, and tied them with baker’s twine and the sweetest wooden disposable spoons. I found the plain spoons on etsy, and added the polka dots with the eraser end of a pencil and some aqua ink. I love how they turned out. Inside was a plain vanilla cupcake cut in half and layered with raspberry jam, and aqua coloured icing. The cupcakes made a sweet end, to a very sweet day! 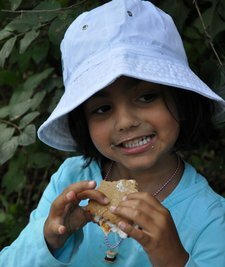 Camp S’more turned out great, the only problem, it was over too soon! 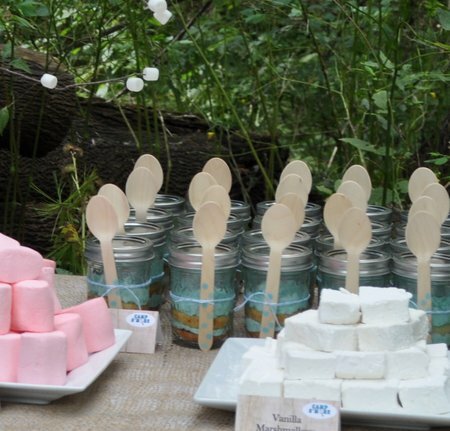 With a Gourmet S’more Buffet in the woods -life is really a party! 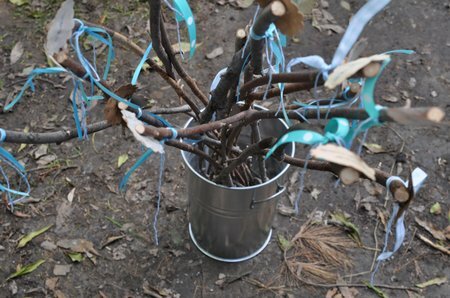 This post is linked up at Between Naps on the Porch, French Country Cottage, Tatertots and Jello, Whipperberry, Tidy Mom, Home Stories A to Z, and Craftberry Bush. 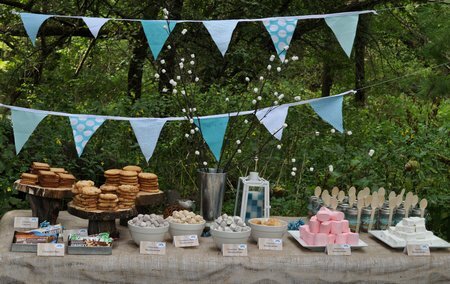 This is such a darling party idea!! I love it! 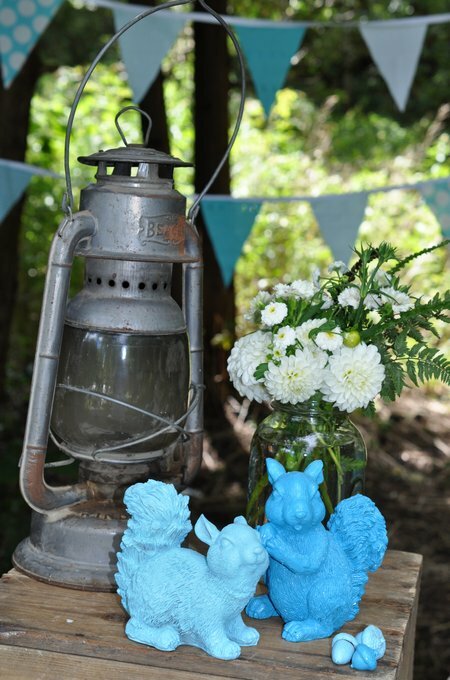 Come link up to centerpiece Wednesday and share this post…soooo fun! I love the idea. It seems everyone had a great time. Two very enthusiastic thumbs up!!!!! I love how the food table so beautifully complements the dining area! Wow! You really went all out for this! I love it! Your daughter and her friends will never forget this truly well put together celebration!!! 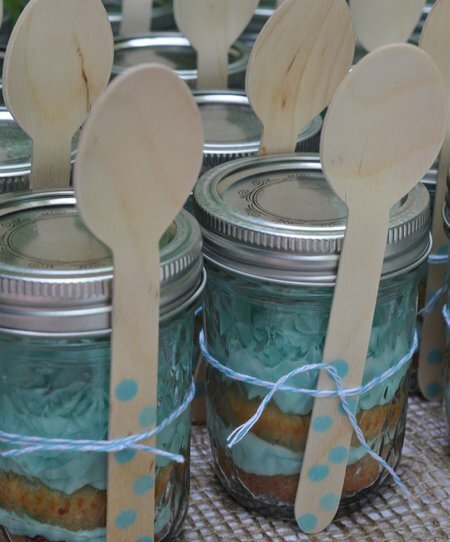 Kudos to you, too, for using the bamboo spoons for the cupcake jars! 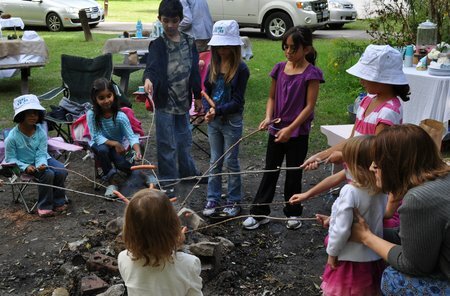 The girls learn about responsible handling of our earth…priceless! 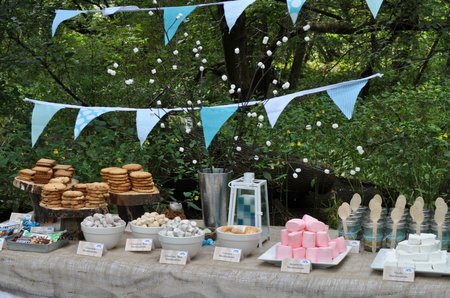 WOW…the party was a-m-a-z-i-n-g……you took care of every detail…I must admit I don’t like roasted marshmallows…but my kiddies LOVE them…my daughter would love this party…..
S’more ANYTHING is fabulous! Love this! Stopping by from Happy Hour! What a fun party! 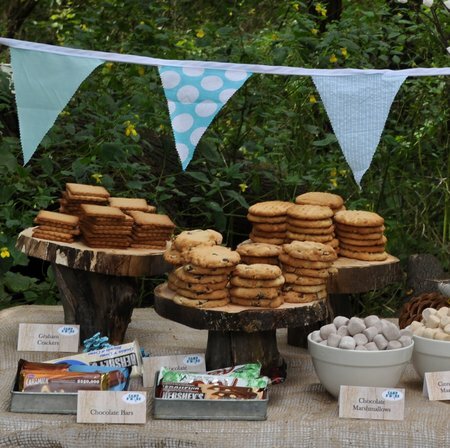 The s’mores look awesome and I love how you put the table together. I bet it was a blast. Thanks so much for linking up to Happy Hour! So great to have you! So adorable!! 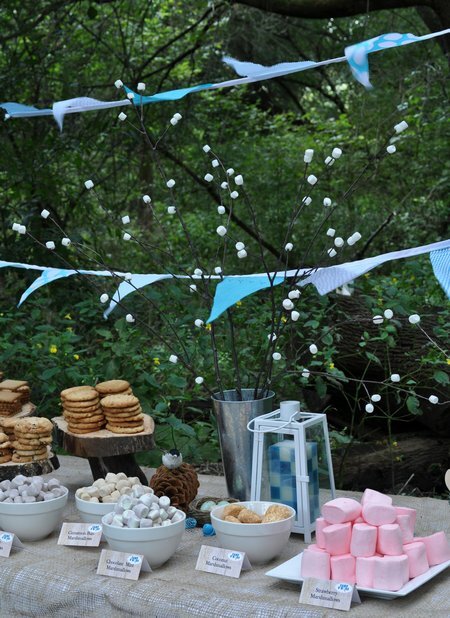 I love all of the details- esp the homemade grahams and marshmallows.